We have talked about the P-Word before, but I still have clients that are scared of it. The root of that fear is often THE HEARING. IN COURT. If you're the executor or executrix of a will, or the adminstrator/adminstratix of an adminstration, this is what you can expect. Scenario #1: Everyone gets along, and there is a valid Will. Venue: First off, the proper county is where the person lived for the last bit of their life, or where they had some property (see TX Probate code Sec. 6.). In some counties, (like Dallas, Fannin, Tarrant, and Hunt, to name a few), the hearings are held in a crowded courtroom, and dozens of cases are heard one after another. 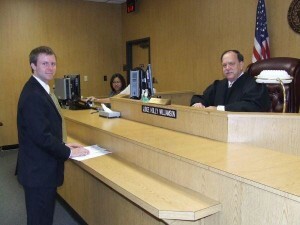 In other counties (Grayson, Collin, mostly the smaller counties but it really depends on the judge and if there is a statutory probate court), the hearing is often less formal, with the judge often shaking your hand at the door to his or her office, and then showing you to a chair right there in the office. You are still giving sworn testimony, but just from a comfy chair instead of a in a courtroom. Either way, its no big deal. Proceedings: At the hearing, you will be sworn in, just like you are giving any other testimony in any court. This makes some people scared. Don't be. Next, you essentially say "yes" or "no" to a list of facts about your deceased relative or friend. "Did they live in this county when they died.... Yes." "Did they have any children born after this will was written...Yes or No (tell the truth). "Is this their last will and testament, and does this appear to be their signature...Yes (it better be)." Easy stuff. 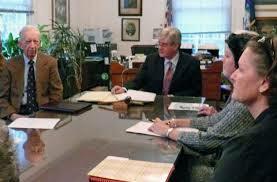 Next, judge will then sign an order admitting the will to probate, and you sign several pieces of paper including an "Oath" which is you just swearing that you will do the right thing as the executor or administrator. After the hearing, you go to the clerk's office and get Letters Testamentary or Letters of Administration which will allow you to go to banks, financial institutions, and other places in order to handle the business of the estate. You will also sign a required notice to creditors, that must be published so that anyone who things the deceased person owes them money can make a claim. Final Steps: Within 90 days of qualifying as executor or administrator, you must file an inventory with the court. If you need extra time, the court will usually let you have it. The inventory lists all the assets which pass under the decedent's will or estate, and not those that are directly distributed out (like POD accounts or insurance to others). After the inventory is filed, the judge will sign an order approving the inventory. Then you're pretty much done with the formal work, all that is left is paying the bills, filing a final income tax return (and an estate tax return if necessary) and distributing the estate. Remember that creditors have 1 year to come back and request you pay them debts, so it is usually a good practice to leave some funds in an account for that. Note: Small estate administrations and muniments of title are similar to this, with less requirements. Scenario #2: Everyone gets along, and there is no will. Venue: Always the same, unless its contested, then it might get sent to District Court. Proceedings: Since there is no will, an Attorney Ad Litem will have been appointed to do background research and determine the heirs. They will be at the hearing, and the estate has to pay them (think of this as the I HAD NO WILL tax). The Probate Code requires that you have witnesses if there is no will, think of these as close friends who knew the family, but are not inheriting anything. Some courts will let you get away with 1, many require 2. Sometimes you can have this done by an affidavit, so just check with the specific court. Everything else is the same. Final Steps: Same as above. Venue: Same as above, if there is not a contest to the will. Proceedings: If the will names an independent executor, and this is not challenged, all is the same. Else, you have a fight on your hands, and this is where things get messy. Make sure your lawyer knows their stuff. Else, if you can actually get it to the probate hearing, its all the same. Final Steps: Same, and good luck getting your family to agree on who gets Dad's old boots or Mom's favorite china. Scenario #4: No one gets along, no will. Venue: Same as above, depending on the county. Proceedings: Now you are stuck in Dependent Administration land, which we have discussed before. This means you will be in court, a lot, and your legal bills will be high. Can't we all just get along? Final Steps: Dependent administrations require annual accountings as well as a final. There are also some more paperwork to deal with, as well as dealing with creditors claims. Most of probate is easy, and not scary. If you have a fight, it is no different from any other lawsuit, and those can be scary. Just make sure you know what you are getting yourself into before you show up at the courthouse unprepared.